Mannosylglycerate (MG) is one of the most widespread compatible solutes among marine microorganisms adapted to hot environments. This ionic solute holds excellent ability to protect proteins against thermal denaturation, hence a large number of biotechnological and clinical applications have been put forward. However, the current prohibitive production costs impose severe constraints towards large-scale applications. 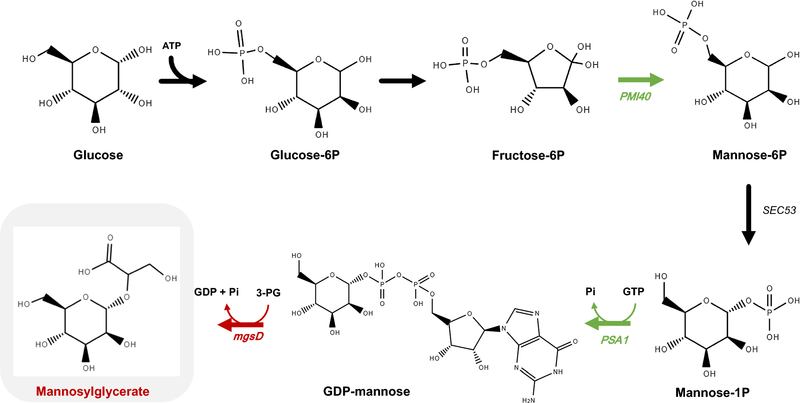 All known microbial producers synthesize MG from GDP-mannose and 3-phosphoglycerate via a two-step pathway in which mannosyl-3-phosphoglycerate is the intermediate metabolite. In an early work, this pathway was expressed in Saccharomyces cerevisiae with the goal to confirm gene function (Empadinhas et al. in J Bacteriol 186:4075–4084, 2004), but the level of MG accumulation was low. Therefore, in view of the potential biotechnological value of this compound, we decided to invest further effort to convert S. cerevisiae into an efficient cell factory for MG production. To drive MG production, the pathway for the synthesis of GDP-mannose, one of the MG biosynthetic precursors, was overexpressed in S. cerevisiae along with the MG biosynthetic pathway. MG production was evaluated under different cultivation modes, i.e., flask bottle, batch, and continuous mode with different dilution rates. The genes encoding mannose-6-phosphate isomerase (PMI40) and GDP-mannose pyrophosphorylase (PSA1) were introduced into strain MG01, hosting a plasmid encoding the MG biosynthetic machinery. The resulting engineered strain (MG02) showed around a twofold increase in the activity of PMI40 and PSA1 in comparison to the wild-type. In batch mode, strain MG02 accumulated 15.86 mgMG g DCW −1 , representing a 2.2-fold increase relative to the reference strain (MG01). In continuous culture, at a dilution rate of 0.15 h−1, there was a 1.5-fold improvement in productivity. In the present study, the yield and productivity of MG were increased by overexpression of the GDP-mannose pathway and optimization of the mode of cultivation. A maximum of 15.86 mgMG g DCW −1 was achieved in batch cultivation and maximal productivity of 1.79 mgMG g DCW −1 h−1 in continuous mode. Additionally, a positive correlation between MG productivity and growth rate/dilution rate was established, although this correlation is not observed for MG yield. Enzymes and other proteins are used in a myriad of applications such as clinical and analytical tests, research, therapeutics, vaccines, food processing, textile industry, cleaning, and biofuel production. In every case, the preservation of the native structure under working conditions is a prerequisite for efficacy. While some proteins are remarkably robust and can stand harsh conditions or repeated work cycles, others require the presence of extrinsic stabilizers, or chemical chaperones, to prevent unfolding and/or assist refolding. Osmolytes, like glycerol and trehalose, which accumulate inside the cell to counterbalance the external osmotic pressure, are well known protein protectors [1, 2]. The discovery of marine hyperthermophilic organisms in the early 1980s uncovered an untapped source of new osmolytes . Microorganisms adapted to those extreme environments accumulate exquisite organic solutes, usually bearing a negative charge, which are absent from mesophilic prokaryotes. Importantly, these ionic solutes accumulate not only in response to elevated osmotic pressure, but also in response to supraoptimal growth temperature, suggesting a potential role in thermoprotection of cell components in vivo . Mannosylglycerate and di-myo-inositol-phosphate are the most widespread solutes among marine hyperthermophiles [2–5]. In vitro studies have shown that these compounds are better protein stabilizers than trehalose, glycerol or any other known neutral solutes [6–11]. In particular, MG showed superior performance in a wide range of application tests [6–12]. For example, 0.5 M of MG resulted in a 7.1 °C increase in the melting temperature of the model protein, staphylococcal nuclease, while the same concentration of glycerol or mannosylglyceramide produced increments of < 1 °C and 2.4 °C, respectively . Importantly, we showed that MG was able to inhibit formation of α-synuclein inclusions in the cytoplasm of yeast cells, a hint of its potential application in drug development against protein misfolding diseases [13, 14]. All known native producers, Archaea and Bacteria, are able to synthesize MG via a two-step pathway: the enzyme mannosyl-3-phosphoglycerate synthase catalyzes the reaction of GDP-mannose and 3-phosphoglycerate into mannosyl-3-phosphoglycerate, which is subsequently dephosphorylated by mannosyl-3-phosphoglycerate phosphatase to give MG [15, 16]. Empadinhas et al. noticed that the genome of the mesophilic bacterium Dehalococcoides mccartyi (formerly D. ethenogenes), comprised a gene encoding two domains with high sequence homology to known mannosyl-3-phosphoglycerate synthase and mannosyl-3-phosphoglycerate phosphatase. The same authors confirmed the functionality of this gene, designated mgsD, by cloning and expression in Saccharomyces cerevisiae, which thereby accumulated intracellular MG up to 7.5 mg g−1 cell dry weight . Capitalizing on these results, we deemed it interesting to invest further efforts to develop S. cerevisiae into a cell factory for MG production. Currently, MG is produced by bitop AG (Witten, Germany) through fermentation of a natural producer. However, this process has very high production costs, preventing the utilization of this compound at an industrial scale or even extensive testing to explore new application areas. We selected S. cerevisiae as a host organism for the engineering strategy since it is a robust industrial workhorse used for the production of a wide range of compounds, such as sesquiterpenes, bioethanol, artemisinic acid, succinic acid and vanillin [18–22]. 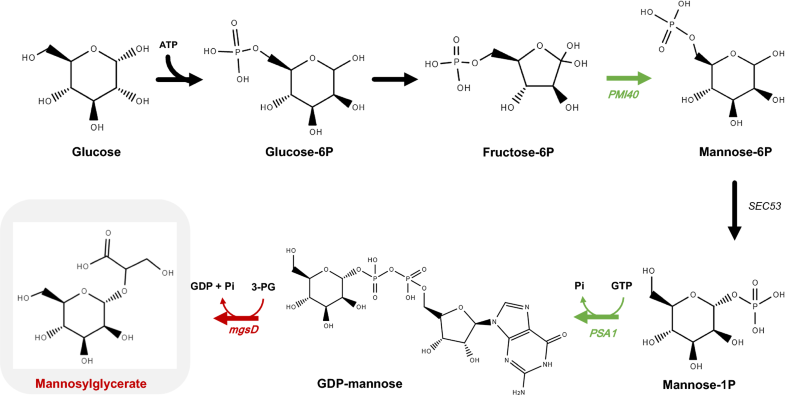 GDP-mannose and 3-phosphoglycerate are the two precursors for the synthesis of MG. We are aware that S. cerevisiae’s anabolic pathways imply a high demand for GDP-mannose. Indeed, this activated sugar is the precursor for protein mannosylation and synthesis of oligomannans, important components of the yeast cell wall [23, 24]. Therefore, our first engineering strategy was intended to enhance the flux towards GDP-mannose synthesis by overexpressing the genes encoding mannose-6-phosphate isomerase and GDP-mannose pyrophosphorylase (Fig. 1). The production of MG by the resulting engineered strain was evaluated under different cultivation modes, such as flask bottles, controlled batch and continuous fermentations at different dilution rates. Saccharomyces cerevisiae strain CENPK2-1C was genetically manipulated to overexpress the genes involved in the synthesis of GDP-mannose and MG (Fig. 1). Two engineered strains were constructed: (i) the first strain (named MG01) harbors the plasmid pDES containing the heterologous gene mgsD encoding mannosyl-3-phosphoglycerate synthase and mannosyl-3-phosphoglycerate phosphatase; and, (ii) the second strain (named MG02), in addition to plasmid pDES, harbors the plasmid pSP02 containing the mannose-6-phosphate isomerase (PMI40) and GDP-mannose pyrophosphorylase (PSA1) genes from S. cerevisiae. The gene PMI40 was cloned under the control of PGK1 promoter and terminator of CYC1, while the gene PSA1 was under the promoter of TEF1 and the terminator of ADH1. These promoters have previously shown high expression levels during growth on glucose . To determine the effect of the overexpression of PSA1 and PMI40 genes, mannose-6-phosphate isomerase and GDP-mannose pyrophosphorylase activities were measured in the MG02 strain and compared with the background strain (S. cerevisiae strain CENPK2-1C). The MG02 strain showed an increase of twofold in the mannose-6-phosphate isomerase activity and 1.4-fold in the GDP-mannose pyrophosphorylase activity in comparison with the background strain (Table 1). Cultivation conditions exert a great impact in the performance of producing strains. In particular, S. cerevisiae is known to accumulate ethanol as a major by-product in aerobic conditions under certain circumstances, and these different metabolic states may affect the production of the desired compound. When there is a low glucose uptake rate, S. cerevisiae exhibits a respiratory metabolism only, with no ethanol formation, while, when the glucose concentration and/or uptake rate surpasses a critical threshold value, the metabolism becomes a combination of respiration and alcoholic fermentation . In this work, the engineered strains were grown under conditions that imposed a respiratory vs respiro-fermentative metabolism; the fitness and MG accumulation parameters were determined under these conditions. The engineered strains were initially characterized in shake flasks using synthetic complete medium (SC medium) with 20 g L−1 of glucose. MG01 and MG02 exhibited similar growth rates (0.24 h−1 for MG01 vs 0.25 h−1 for MG02), but biomass production was different: 0.13 ± 0.01 gDCW g glc −1 for MG01 and 0.10 ± 0.00 gDCW g glc −1 for MG02. Profiles of growth, glucose consumption, ethanol, glycerol and acetate production are shown in Additional file 1: Figure S1 indicates a higher production of ethanol and growth for strain MG01 but the same production of glycerol and acetate for both strains. The intracellular content of MG was determined after glucose depletion and, under these conditions, MG02 showed a 1.5-fold increase in MG production compared to the reference strain MG01. A comparison between shake flask and controlled bioreactor for both strains is depicted in Additional file 1: Table S1. S. cerevisiae GDP-mannose pool had been successfully increased before by the over-expression of the gene MPG1 (PSA1) in a multi-copy plasmid . In the present work, it was possible to increase MG production by over-expressing PSA1 (MPG1) and PMI40, which re-directed part of the glycolytic flux towards the formation of GDP-mannose and consequently to MG. In order to check whether MG accumulation could be enhanced by a controlled environment, strains MG01 and MG02 were grown in a 2-L bioreactor. In controlled batch cultivation, MG02 produced 15.86 mg g DCW −1 of MG, which represents an increase of 2.2-fold in comparison to MG01 (Fig. 2a). In controlled batch cultivation, using a bioreactor, it is possible to maintain optimal conditions regarding pH, concentration of oxygen and temperature. Under these conditions, strain MG02 produced higher amounts of MG than in shake flasks. Moreover, MG01 and MG02 showed no detectable difference in the production of end-products ethanol, glycerol and acetate (Fig. 2b). Since the relative contribution of respiratory and respiro-fermentative regimens in S. cerevisiae depends on glucose availability, it is difficult to achieve a pure respiratory regimen in controlled batch cultivations. Therefore, a clear distinction of the two metabolic states is only possible in fed-batch and chemostat cultures. In an aerobic environment and in the presence of high concentrations of glucose, S. cerevisiae has a fermentative/respiratory metabolism due to a limited respiratory capacity . In addition, there is a molecular response whereby the TCA cycle is repressed and the metabolic flow towards fermentation products is increased, a phenomenon designated as the Crabtree effect . This behavior happens independently of the presence of oxygen to support respiration and is seen as an adaptive response to a competitive environment, as fermentation increases S. cerevisiae’s growth rate. Nevertheless, it is possible to ensure a respiratory metabolism as long as the glucose uptake rate is kept below the critical threshold that activates fermentation. To investigate the impact of the respiratory and fermentative states in MG production, both strains were grown in chemostats at a dilution rate of 0.1 h−1, where, in principle, respiration is favored and the production of ethanol is reduced (or even abolished) . Under these conditions, the yield of MG is consistently higher for MG02 in comparison with MG01 (Table 2) and MG productivity is 0.76 mg g DCW −1 h−1 for MG01 and 1.17 mg g DCW −1 h−1 for MG02, which represents a 1.5-fold increase. However, it is apparent that the two strains display different metabolic modes, as MG01 has a Respiratory Quotient (RQ) of 1.39, a value close to fully respiratory metabolism , while MG02 has an RQ value of 2.32, which denotes a respiro-fermentative metabolism. This result is also corroborated by the accumulation of higher amounts of ethanol and glycerol in MG02 (Table 2). Despite the RQ differences, the biomass yield under these conditions remains the same for both strains. Most likely, the differences in by-products accumulation are not high enough to provoke an observable decrease in the biomass yield, given the experimental error. Therefore, we conclude that the higher production of MG or/and directly the over-expression of PSA1 and PMI40 correlate with a significant decrease of the respiratory capacity of the cell. Although no previous work has reported the physiological impact of overexpressing these two genes, it would be counter-intuitive to assume that a diversion of part of the glycolytic flux would increase by-product accumulation. Additionally, the ionic nature of MG might be unbalancing cell homeostasis and therefore reducing cell fitness for MG02, as 15.86 mgMG g DCW −1 represents an intracellular concentration of approximately 25 mM, which is a substantial value for an organism that intrinsically accumulates non-charged osmolytes, like glycerol and trehalose [1, 30]. Increasing concentrations of MG produces an acidification of the cytoplasm (pKa of MG is 3.35) which can compromise growth [31, 32] and impair essential metabolic functions . S. cerevisiae cultivated in aerobic conditions with glucose as carbon source, switches from respiratory-fermentative growth to mainly fermentative growth in the presence of high concentrations of acetic acid, that shares with MG the characteristics of a weak acid. Under these conditions, a significant decrease in the specific rate of O2 consumption was observed while high level of CO2 were maintained , as observed for the MG02 strain. Additionally, the metabolic shift to a fermentative behavior (higher RQ) observed in MG02 has been described before for other inhibiting compounds such as furfural, a compound known to inhibit glycolytic enzymes, react with cellular constituents and compromise the respiratory activity [34, 35], although the mechanisms of action are probably different from weak acids. Additionally, steady-state MG02 cells cultivated under a dilution rate of 0.1 h−1 showed a profile of ethanol production that is largely influenced by the concentration of ethanol produced during growth in the batch mode. Chemostat experiments were initiated with different ethanol concentrations, which apparently produced different results for the ethanol concentration at steady-state, explaining the high standard deviation associated with ethanol production observed in Table 2. However, the rate of ethanol decrease from the beginning of the chemostat until steady-state is very similar for both experiments (see Additional file 1: Figure S2). The fact that the initial ethanol concentration is not fully washed from the bioreactor during the continuous cultivation at low dilution rates may be another indication that both strains are not in full respiratory regimen . However, the influence of initial ethanol concentration in continuous cultures in the respiratory capacity has not been, to our knowledge, previously reported and remains unexplained. To evaluate the impact of increasing the dilution rate, we performed chemostat experiments at dilution rates close to the maximum (washout) values (0.15 h−1 for MG02 and 0.2 h−1 for MG01). The difference between MG01 and MG02 in MG production observed at 0.1 h−1 is kept, while the productivity of both strains in chemostats at 0.1 h−1 dilution rate is lower when compared to chemostats performed close to maximal dilution rates (Additional file 1: Table S2). Curiously, MG yield on biomass is not influenced by the variation on the dilution rate, either for MG01 or MG02, although for MG02 the MG yield on substrate is larger for the lower dilution rate. In order to understand the role of different metabolic states in the production of MG and to gain insight into the respiratory capacity, cells from MG02 were cultivated in a chemostat at dilution rate of 0.05 h−1 to allow for fully respiratory mode. A comparison of the three dilution rates for this strain shows that, as expected, the biomass yield on glucose decreases with high dilution rates (Fig. 3a). In aerobic glucose-limited chemostat cultures, it is well-known that when yeast cells are cultivated at high rates (close to the maximal growth rate), the flux from glycolysis is re-directed to the production of by-products (e.g. ethanol) and respiration is kept at lower levels. However, when the dilution rate is reduced, respiration becomes the major source of energy through TCA cycle and consequently, the production of biomass increases . Also, by gradually decreasing the dilution rate in MG02, we verified a decrease in the production rate of MG (Fig. 3b). However, there is no correlation between the dilution rate and MG yield on glucose (Fig. 3c) or even production on biomass (remains the same for dilutions 0.15 and 0.1 h−1 (Additional file 1: Table S2) and decreases to 8.21 mgMG g DCW −1 at dilution 0.05 h−1). Despite the lack of correlation with dilution, MG seems to reach a peak of production in terms of yield per substrate at 0.1 h−1 dilution rate (Fig. 3c). In light of these results, we can conclude that MG production does not respond linearly to a variation on the growth rate; however, as cells are growing more rapidly, MG productivity is higher at higher dilution rates. Another important result is the variation of RQ values with the dilution rates examined. 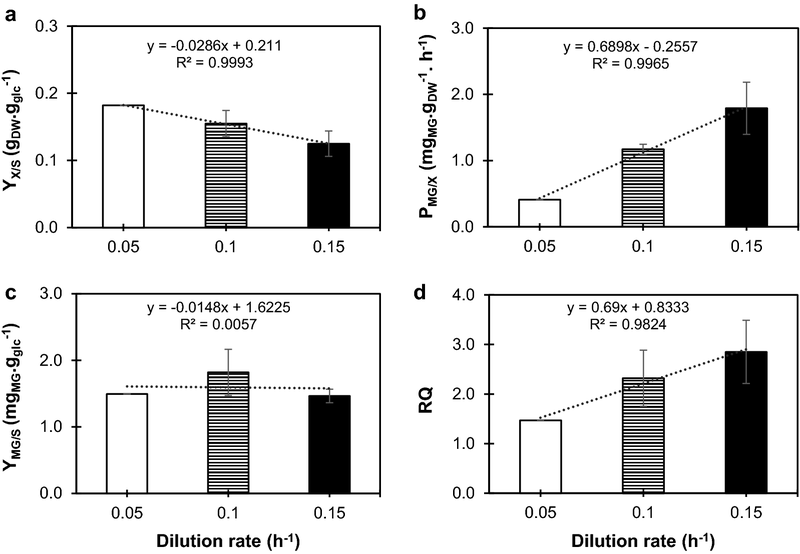 Coherently with previously published results , RQ decreases at lower dilutions and strain MG02 is virtually at a fully respiratory state at dilution 0.05 h−1 (Fig. 3d), corroborated by the absence of glycerol production and decrease on acetate/ethanol yields which dropped to 0.1 g g glc −1 . Continuous mode chemostat presents several advantages in comparison with batch cultures and it is a valuable approach to explore the best conditions for industrial production. One advantage, which is exploited in this work, is the evaluation under controlled conditions of physiological parameters based on growth rates . The cultivation of S. cerevisiae in respiro-fermentative metabolic mode holds some issues as it is accompanied by the accumulation of by-products and low biomass yield. Additionally, ethanol production might interfere with the productivity of compounds by provoking toxicity . For this reason, industrial bioprocesses usually use a dilution rate of 0.1 h−1 or lower  as is the case of resveratrol production . Nonetheless, the respiro-fermentative metabolism favors the production of certain compounds. In a recent study, the cultivation conditions for ethylene production were optimized and were found to be coupled with the growth rate . MG is produced from GDP-mannose and 3-phosphoglycerate (3PG), both derived from glycolysis. As the respiro-fermentative metabolism of S. cerevisiae implies a higher glycolytic flux than respiration, it is reasonable to speculate that MG production would increase with higher growth rates in chemostat. Additionally, it has been described that PSA1 is an essential gene linked to the progression of cell cycle, since efficient glycosylation of proteins is a key-point for cell division . Even more, PSA1 transcript levels increase with higher growth rates , which may favor the synthesis of GDP-mannose and ultimately the synthesis of MG. In the present work, this correlation between MG production and growth rates was not observed. The fact that MG production was not dependent on growth rate may indicate that there is a bottleneck downstream of GDP-mannose, i.e., in the production of MG which is catalyzed by the bifunctional enzyme mannosylglycerate synthase/phosphatase. In this study, we have increased the yields and productivity of mannosylgycerate (MG), a protein stabilizer with outstanding properties, by over-expressing PSA1 and PMI40 (GDP-mannose pathway) and by optimizing the mode of cultivation. The resulting strain MG02 presents up to 2.2-fold improvement in MG production on biomass, being able to produce 1.79 mg of MG per gram of biomass per hour at a dilution of 0.15 h−1. Also, it was not possible to establish a correlation between growth rate and MG yield on substrate, although MG productivity increases with higher dilution rates. New rounds of optimization are needed to produce MG in S. cerevisiae at adequate levels, i.e., well above the values reported for organisms that naturally produce this compound. For instance, evaluate the overexpression of SEC53 gene and improve the expression of MG synthase. To this end, a holistic approach should be considered, based on in silico driven metabolic engineering to find gene targets that will improve MG production. Saccharomyces cerevisiae genomic DNA for colony PCR and gene amplification was prepared as described by Lõoke et al. . Primers were purchased from Metabion (Germany). Gene amplification and colony PCR were performed using, respectively, Phusion polymerase and DreamTaq DNA polymerase (both enzymes from Thermoscientific, USA). PCR reactions were performed in a Thermal Cycler from Bio-Rad (USA), following the protocols recommended by the manufacturers for each polymerase. Plasmid extraction, PCR product purification, and DNA gel extraction were carried out with Zymo Research kits (USA). All restriction enzymes were obtained in fast-digestion format from Thermoscientific (USA). The plasmid pDES, containing the gene mgsD that codes for mannosyl-3-phosphoglycerate synthase/phosphatase from D. mccartyi under the control of the ENO2 promoter from enolase II, was kindly provided by Milton S. da Costa (University of Coimbra, Portugal) . S. cerevisiae transformation was performed using the lithium acetate method as described by Gietz et al. . Escherichia coli DH5α was used for plasmid isolation and maintenance following the competence and transformation procedures developed by Dower et al. . The plasmid pSP-GM was kindly provided by Prof. Jens Nielsen’s group (Chalmers University of Technology, Sweden) . This plasmid was used to express the mannose-6-phosphate isomerase (PMI40) and GDP-mannose pyrophosphorylase (PSA1) encoding genes from S. cerevisiae. The gene PMI40 was amplified using genomic DNA isolated from S. cerevisiae strain CENPK2-1C with the primers pair 5′-CCGCGGCCGCAAAAAAATGTCCAACAAGCTGTTCAGG-3′ and 5′-CCGAGCTCCTAATTTGGTTCCACAAAGGC-3′. This PCR product was digested with SacI/NotI and ligated into pSP-GM between promoter of TEF1 and terminator of ADH1 using a T4 ligase (Thermoscientific, USA), yielding pSP01. Next, the gene PSA1 was amplified using again S. cerevisiae strain CENPK2-1C genomic DNA with primers pair 5′-GGCCCGGGAAAAAAATGAAAGGTTTAATTTTAGTCGG-3′ and 5′-CCAAGCTTTCACATAATAATAGCTTCCTTTGG-3′. This PCR product was digested with HindIII/XmaI and ligated into pSP01 using a T4 ligase between promoter of PGK and terminator of CYC1, resulting in plasmid pSP02. Colonies harboring pSP01 and pSP02 were identified by performing colony PCR with the primers used in the amplification. Correct constructions of plasmids were confirmed by restriction analysis and DNA sequencing (GATC Biotech, Germany). The strain S. cerevisiae CENPK2-1C, obtained from EUROCARF (Germany), was used as the host strain in this work. The strain MG01 was obtained by transforming CENPK2-1C cells with plasmid pDES (conferring yeast cells the ability to produce MG); strain MG02 was obtained by transforming MG01 with plasmid pSP02, leading to a strain combining GDP-mannose overproduction and MG synthesis (Table 3). Selection and maintenance of plasmids in E. coli was performed in LB medium containing 10 g L−1 of peptone, 10 g L−1 of NaCl, 5 g L−1 of yeast extract, and supplemented with 100 mg L−1 of ampicillin. The solid LB medium also included 20 g L−1 of agar. All cultivations of E. coli were carried out at 37 °C and 200 rpm of agitation. Saccharomyces cerevisiae strain CENPK2-1C (MATa ura3-52 his3-Δ1 leu2-3,112 trp1-289, MAL2-8c SUC2) was cultivated in YPD medium, containing 10 g L−1 of yeast extract, 20 g L−1 of peptone, and 20 g L−1 of glucose, at 30 °C and 160 rpm. Recombinant strains were selected on Synthetic complete (SC) medium containing 6.7 g L−1 of yeast nitrogen base without amino acids from Difco (USA), 20 g L−1 of glucose and 20 g L−1 of agar. When necessary, histidine (20 mg L−1), tryptophan (20 mg L−1), uracil (20 mg L−1) and leucine (30 mg L−1), were added to cover auxotrophies. All cultivations of S. cerevisiae were performed at 30 °C with 160 rpm agitation. The SC medium used for shake flasks, batch in controlled bioreactors, and continuous cultivation contained 6.7 g L−1 of yeast nitrogen base without amino acids from Difco (USA) supplemented with 20 g L−1 of glucose. For strain MG01, SC medium was supplemented with histidine (20 mg L−1), tryptophan (20 mg L−1), and uracil (20 mg L−1), while for strain MG02 it was complemented only with histidine and tryptophan, in the same concentrations . For shake flask cultivations, MG01 and MG02 were pre-grown in 50 mL of SC medium at 30 °C and 160 rpm. Then, cells were used to inoculate 500 mL shake flasks containing 100 mL of SC medium with an initial OD600 of 0.1. Growth was followed using a spectrophotometer V-560 from Jasco (Japan); cells were harvested at the end of the exponential phase (24 h upon inoculation). Batch cultivations were performed as following: firstly, cells were grown overnight in shake flasks from a single colony. Each fermenter was inoculated at an initial OD600 of 0.1. The batch fermentations were performed in a BIOSTAT-B Plus system (Sartorius, Germany) coupled with a 2-L culture vessel. The operating conditions are the following: the fermentation volume was 0.8 L, the temperature was maintained at 30 °C, the airflow was 1 vvm, the pH was kept at 5.5 controlled by addition of 2 M NaOH, and the dissolved O2 was kept above 30% of saturation by feedback control of the stirring speed from 200 rpm up to 600 rpm. Concentrations of O2 and CO2 in the exhaust gas were monitored by Bluesens gas analyzers (Germany) and RQ represents the ratio between CO2 produced and O2 consumed during fermentation. Biological samples were collected at the end of the exponential phase, when CO2 production dropped drastically. Continuous cultivations were also carried out in a Sartorius BIOSTAT-B Plus system coupled with a 2-L culture vessel with a constant working volume of 0.8 L, with the same controlled variables and set-points as before. The medium described above was used to feed the bioreactor at dilution rates of 0.05, 0.1, 0.15 and 0.2 h−1. The volume was kept at 0.8 L by controlling the level of broth inside the vessel. To guarantee that the culture reached a steady-state mode, at least 5 volumes of medium were allowed to pass through the culture whenever the dilution rate was changed. Samples were collected when O2 consumption and CO2 production were constant. For each sampling, 50 mL of broth were removed from the culture and centrifuged at 3600×g for 10 min to separate cells from the medium. Next, the supernatant was filtered through a membrane filter with a pore size of 0.22 μm into HPLC vials and stored at − 20 °C until further analyzed for glucose, glycerol, acetate, and ethanol. MG is an intracellular compound and was extracted from the cell pellet by adding 5 mL of water, 5 mL of methanol and 10 mL of chloroform. This mixture was vigorously shaken with the help of a vortex and then centrifuged at 12,000×g for 30 min at 4 °C. The top part, corresponding to the aqueous phase, was carefully transferred to a new tube and the process of centrifugation was repeated after the addition of 5 mL of water. Once the aqueous phase was separated, samples were evaporated using a Savant™ SPD131DDA SpeedVac (Thermoscientific, USA). Next, the evaporated samples were dissolved in 1 mL of water and transferred to an HPLC vial. Analysis was performed in an HPLC apparatus from Jasco (Japan) model LC-NetII/ADC equipped with UV-2075 Plus and RI-2031 Plus detectors, also from Jasco. The samples were analyzed using an Aminex HPX-87H column from Bio-Rad, which was kept at 50 °C, and a solution of 0.01 M of H2SO4 was used as the mobile phase with a flow rate of 0.3 mL min−1. Quantitative analysis of glucose, MG, glycerol, acetate and ethanol was performed by comparison with a mixture of standards with known concentrations of each metabolite. MG standards were obtained from cell biomass of Rhodothermus marinus as previously described . Calibration curves were prepared using the peak areas of the RI detector for glucose, glycerol, acetate and ethanol and of the UV detector at 210 nm for MG. The cell dry weight was determined by filtering 5 mL of culture broth through a 0.22 μm pore Millipore filter and washing once with 5 mL of water. Filters were then dried for 10 min at 150 W in a microwave oven and weighted using an analytical balance. For the determination of mannose-6-phosphate isomerase and GDP-mannose pyrophosphorylase activities, strains WT and MG02 were grown in shake flasks until mid-exponential phase. Cells were harvested by centrifugation and re-suspended in water with a cocktail of protein inhibitors (1×), following manufacturer’s instructions (Roche, USA). Next, cells were broken with three pulses of vortexing (4.0 m s−1 for 60 s) using a Fastprep 24 system (MP, USA), keeping cells on ice for 5 min between each pulse. Supernatants were obtained by centrifugation at 13,500×g for 5 min and used to determine enzymatic activities. Total protein was determined using the Bradford method . The spectrophotometric methods used to determine the enzymatic activities have been described by Bergmeyer . Briefly, for the mannose-6-phosphate isomerase activity, the assay mixture (final volume of 1 mL) contained: 50 mM Tris–HCl (pH 7), 5 mM mannose-6-phosphate, 8 mM MgCl2, 2.8 mM NADP, 0.27 U glucose-6-phosphate dehydrogenase, 0.27 U phosphoglucose isomerase, and 0.25 mg of cell extract. Reactions were started by the addition of mannose-6-phosphate and absorbance was measured at 340 nm for 2 min. For the GDP-mannose pyrophosphorylase activity, the assay mixture (final volume of 1 mL) contained: 50 mM of Tris–HCl (pH 7), 0.5 mM NaF, 10 mM MgCI2, 0.1 mM ADP, 1 mM glucose, 1 mM NADP, 2 mM PPi, 5.5 mM GDP-mannose, 1 U each of nucleoside kinase, hexokinase, and glucose-6-P dehydrogenase, and 0.25 mg of cell extract. The reaction was started by the addition of GDP-mannose, and the formation of NADPH was monitored by recording the absorbance at 340 nm for 2 min. One unit corresponds to the conversion of 1 µmol of substrate per minute. CF carried out the experiments, analyzed the data and drafted the manuscript. IR and HS conceived and supervised the study. HS, IR and NB supervised and reviewed the final manuscript. All authors read and approved the final manuscript. All the data generated and analyzed in this study are included within the article (and it additional file). This study was supported by the Portuguese Foundation for Science and Technology (FCT) under the scope of the strategic funding of UID/BIO/04469 unit and COMPETE 2020 (POCI-01-0145-FEDER-006684), BioTecNorte operation (NORTE-01-0145-FEDER-000004) funded by the European Regional Development Fund under the scope of Norte2020—Programa Operacional Regional do Norte and also by project LISBOA-01-0145-FEDER-007660 (Microbiologia Molecular, Estrutural e Celular) funded by FEDER through COMPETE2020—Programa Operacional Competitividade e Internacionalização (POCI). Cristiana Faria was supported by a Ph.D. Grant from FCT (Ref. SFRH/BD/79552/2011). 12934_2018_1023_MOESM1_ESM.pptx Additional file 1: Figure S1. Growth and end-products formation of the strains MG01 (A) and MG02 (B) cultivated in shake flask with SC medium containing 20 g L−1 of glucose. Data represent the mean of three independent experiments. Gly—glycerol; Acet—acetate; EtOH—ethanol. Table S1. MG and end-products production and yields for the engineered strains MG01 (mgsD) and MG02 (mgsD ↑pmi40 ↑psa1) cultivated in shake flask and batch fermenters. Data represent the mean ± SD of at least three independent experiments. Table S2. Physiological parameters and MG yields for the engineered strains MG01 (mgsD) and MG02 (mgsD ↑pmi40 ↑psa1) in chemostat cultivation at different dilution rates. Figure S2. Profile of glucose consumption, acetate, glycerol, ethanol and MG production from the beginning until steady-state for strains MG01 (A) and MG02 (B) cultivated in two independent chemostats (experiment 1 and 2) with dilution 0.1 h−1.